Painted mason jars are nothing new, I know. Mason jars painted with chalk paint just go together so well! And as a DIY blogger, it was time for me to finally try out Annie Sloan chalk paint and see what all the fuss is about. Since it was my first time with chalk paint, I started with mason jars before I get too crazy painting up all the furniture in my house. My idea was to turn them into mason jar canisters for the kitchen. I had the larger size mason jars and I’ve been using them for canisters for a while now. They make good canisters because you can fit a lot in them without taking up much counter space. But because they were clear, it looked messy. I ordered the sampler kit of Annie Sloan Chalk Paints (you can choose which 5 colors you prefer) and a jar of the wax. The wax also came with the towels to apply it. This paint is only sold in select retail stores. You can look up local retailers here. For anyone new to Annie Sloan chalk paint, this paint adheres to almost anything without any sanding needed. I started with the shade Louis Blue, the jar on the left has two coats and the one on the right has just one. I had one extra mason jar so I used that one to experiment. Next, I added the pure white to one side of the extra mason jar to see how that would look. Then I added the shade of Old White to the other side for comparison. I wanted to achieve a distressed, layered look. In the next photo, the first jar had 2 coats of blue and 2 coats of white, with a lot of sanding. I didn’t love that one. The middle is two coats of blue, 1 coat of white, that was much better. The third has 2 coats of blue, and two very light coats of white, that was my favorite. I found that adding water to the paint gives you a much smoother finish and fewer brush strokes. When it gets too dry, you get a crackled effect. It also dries quickly, so I poured a bit of the paint into a paper cup and shut the lid on the sample pot to keep it from drying out. I think it’s best to work in small batches. You can see the chalky effect of the paint here. You can sand it smooth once its dry. Next, I added the clear wax, in a circular motion, with the provided towel. Immediately after applying the wax, you go over it with another towel to buff it (wax on, wax off). I used only 1 coat of wax, but I’ve read for heavily used items it’s recommended to do 2 or 3. The jar of wax is large and will last you a long time. The purpose of the wax is to seal and protect the paint and to enhance the paint color. The wax is also sold in a dark color if you prefer an aged look over the paint. This picture illustrates how it looks with and without the darker wax applied. Here are my completed mason jar canisters. I found the little chalkboard hangers at Home Goods, here are some similar chalkboards I found online. This set has a decorative edge* which I like. This set has a cute little frame around them. My opinion on chalk paint is that it’s worth the money, I’m definitely hooked. A little paint goes a long way, I have plenty left from these little sample pots for more projects. I love that there is no sanding needed unless you want to distress it after. It dries quickly between coats (good if you’re impatient like myself) and it has no odor. The instructions say to use in a well-ventilated area, but since it was about 2 degrees the day I painted these I didn’t open any windows, and still, there wasn’t any odor. I’m so happy with my new mason jar canisters! You can see my entire kitchen makeover here. Oh wow, I love how these turned out! I have yet to use Annie Sloan myself and have been itching to give it a try. Thanks for the inspiration! I love mason jars. Thank you for the great idea! These are so cute, I love the colors you picked. I love anything with mason jars! They are so versatile. I also work with Annie Sloan paint so this was pretty much a perfect post for me! Thanks for sharing on My 2 Favorite Thing on Thursday!! Come join the party again next week!! These are so cute!! I love how they turned out with the chalk paint. I’ve been redoing my kitchen and mulling over what canisters to buy- I think these are a winner! Thanks for sharing! These came out so cute! Thank you for sharing on Show Me Saturday! Oh wow. they turned out so nice. And you don’t have to prep the glass before you paint on it? Thanks Darlene, no prep other than I ran the jars through the dishwasher. You have sealed the deal for me to try Annie Sloan. I have been wanting to for awhile and this is it. It’s happening! This tutorial is so GREAT. I would love if you linked this up to Totally Terrific Tuesday that goes live tonight at 9pm CST. Thank you so much for sharing and hope to see you there! Pinning and sharing. Looks wonderful–and I love those chalkboard tags! Thanks for linking up to the Pretty Preppy Party. I love these sweet mason jar canisters. The tags are a nice touch. Thanks for linking up to On Display Thursday. These are looking great! I like so much the tags! These are adorable! Super cute! I’m going to share this. Thanks for linking this up at Totally Terrific Tuesday last week. It goes live tonight at 9pm CST. Can’t wait to see what else you have to share! Hope to see you there! These are adorable! Love those chalkboard tags too! Thanks for sharing at my Creative Ways Link Party. Hope you’ll be back tonight with more goodies! These are so cute! I love AS Chalk Paint but didn’t know that they sold a little sample set like that – it would be so nice to try out some colors before committing to a whole quart. So glad you shared this cute project on Best of the Nest! 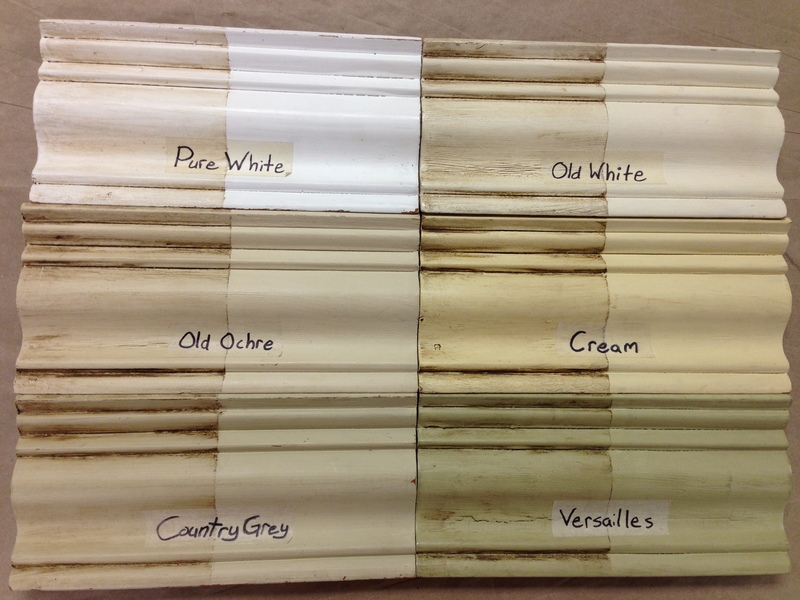 You stated Chalk Paint is only found in a few select stores. You are wrong, Chalk Paint is found in so many stores such as: Home Depot, Walmart, Menard etc. Thanks Mary, I meant Annie Sloan brand chalk paint. There are other brands of chalk paint but I haven’t found one that compares to Annie Sloan yet.